For rolls, stir together warm milk, yeast and 1 tablespoon sugar in large bowl. Let stand 5–10 minutes or until foamy. Add butter, remaining 3 tablespoons sugar, egg yolks, vanilla and salt. Mix with electric mixer using dough hook on medium speed until combined. Gradually add flour, 1 cup at a time, and mix on medium speed until smooth, elastic dough forms, about 5 minutes. Spray large bowl with vegetable pan spray. Form dough into ball, place into bowl and cover with plastic wrap. Let stand in warm place for 45 minutes or until doubled in size. For filling, stir together butter, sugar, flour and cinnamon in medium bowl until well-combined. Prepare 13-by-9-inch pan with vegetable pan spray. Punch dough down and roll out to 18-by-14-inch rectangle on floured surface. Spread filling onto dough and roll up from long end, like a jelly roll. Pinch seam to seal, trim ends and cut into 12 equally-sized pieces. Place rolls into prepared pan; cover with plastic wrap and let rise 25–30 minutes or until doubled in size. Meanwhile, heat oven to 350°F. 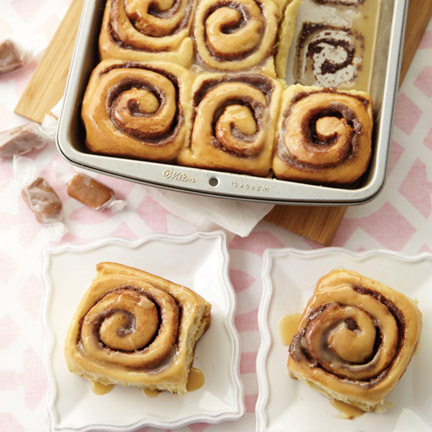 Remove plastic wrap from rolls and bake 25–29 minutes or until golden brown. Cool in pan on wire rack while preparing glaze. For glaze, melt butter in saucepan over medium heat. Add brown sugar and cream. Cook over medium-high heat until mixture reaches a simmer; cook for 1 minute, stirring constantly. Remove from heat and stir in vanilla and salt. Whisk in confectioners’ sugar until smooth. Pour glaze over warm rolls. Serve warm.